I am going to try to have fun with this blog but at the same time keep you up to date on the AFL action. My name is Anthony Bass. I am a pitcher for the San Diego Padres. I call Trenton, Michigan my hometown even though I was born in Dearborn, Michigan. I attend Wayne State University and am majoring in Business Finance, which I am in the process of completing my degree. I come from a fairly large family of 6. My parents are Ed and Linda. I have two older sisters (Beth Ann and Amy) and one younger brother (David). All of my siblings played sports growing up including basketball, baseball, softball, and football. Even though we are from the north (hockeytown) we have never played hockey. Weird. In my spare time, and yes we do have some time away from baseball, I enjoy fishing, golfing, playing my guitar, and watching movies. I enjoy playing alternative music on my guitar such as the Goo Goo Dolls, Snow Patrol, and Lifehouse. I have been playing for about 5 years now and I still consider myself an amateur by all means. My family and faith are my life. I am very blessed to be able to play a child’s game for a profession. At times it is easy to get caught up in negative talk but I try to stand back and consider the fact that I am one of very few in the world to be able to put on a baseball jersey and go out on a baseball field with 8 other teammates to play the greatest game alive and get paid for it. Wow! I am looking forward to spending the next month and a half with some of the greatest baseball players in the world. I plan on picking their brains and learning as much as I can during the short period of time we have together. I am excited to continue to grow as a ball player and ready to take my game to all new heights with the help of my new/former teammates and the tremendous staff of the Peoria Javelinas. Let’s have some fun and can’t wait to see our fans at the ballpark. God Bless! You can also follow me on Twitter and on Facebook! Thank you Cheri. I’m looking forward to a productive yet fun 7 weeks with some great players. This blog thing is pretty cool. Good luck Anthony. Looking forward to your updates! Thank you Mrs. Hamren! I apologize about Twitter btw. I don’t even know how to do that. Nice first post. I’m a Padres season ticket holder and saw your last game. Looking good. Wishing you a productive fall and hoping for a big summer 2012. Go Padres! Funny that you called my typo because my cousin sent me a message saying the same thing lol. I apologize. Thank you for following my blog! I’m also from an HockeyTown (Montreal, QC, Canada) and never played hockey (played only at the neighborhood’s outside public rink). But now, I have to catch-up with hockey coaching lessons in order to get involved in my 10-year old son’s hockey team. I’m still playing baseball in an adult amateur league. I’m having a blast with my buddies! I’m a fan of the Padres for two reasons: 1) I felt in love with San Diego when I’ve spent 3-weeks in Chula Vista during the summer of 2010. 2) The SD Padres came to life in 1969, the same year that our own MLB Team (Montreal Expos, now the Nationals) joined the NL. That being all said, I think that it is really cool to know a little bit more about my favorite team’s prospects. Thanks for sharing! Hey Gino, thanks for following my blog. Yeah, I come from a major hockeytown in Trenton, Michigan. I enjoy watching hockey but I couldn’t skate if my life depended on it. I hope to see you out at a Padres game in 2012. Take care! 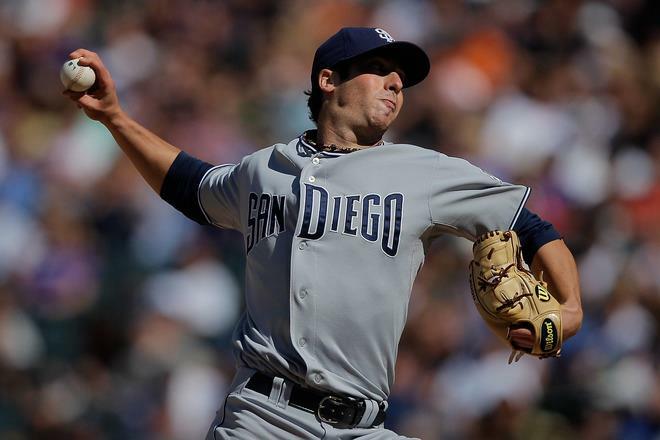 A a San Diego native and life long Padres fan I hope the AFL goes well for you. I will be following your blog just as I follow all the Padre come up through the system. A few questions: 1. What will you be working on and what do expect to accomplish in the AFL? Were you surprised that Randy Ready was not retained? PS. Being a San Diego Native I have never surfed..Weird. but I have played Ice hockey and in my prime I was a pretty good goalie. Hey Steve, thanks for the comments. I will be working on controlling the running game and also continuing my command of all my pitches. Randy Ready is a great person and it was sad to see him leave. I guess we have something in common then lol. Thanks again for following! Good Luck in fall ball this year. I live about 3 hours down I-75 from your home town. I have an Aunt & Uncle who used to live in Dearborn and visited many times years ago. Looking forward to reading your blog this fall. That’s great. So you must be from Ohio? Thank you and I will keep you up to date on the latest from the Peoria Javelinas. Yes. Lived in Ohio for 46 years, moved to New Hampshire for 2 years and now back in Ohio for the past 6 years. AB, I have been fortunate to see your first two big league starts vs. the Rockies. We have season tickets on the first row of LF where you guys run and shag balls and I was able to speak to you on your last start. We’ll be out for some AFL games the first week in November and look you up. God bless you, stay healthy. Thank you Danny. Denver, Colorado is a beautiful city. Looking forward to pitching their next season. See you in Arizona! Thank you for the kind words Paula. I look forward to learning a lot while I’m here playing for the Peoria Javelinas. Go get’em Anthony. Hopefully our paths will cross paths when you get back to Michigan. I will try to see you pitch in Cincy, Pittsburg or Chicago next year. Thank you Cheryl. I hope to see you out at a Javelinas game! Welcome Anthony! I love it when players join the blogging community. Best of luck to you and GO PADRES!!!! Thank you, I’m looking forward to having fun with this blog. My name is Jill, I love watching Padres Baseball. Can’t wait until 2012. Hope to see you at Friar-Fest. Keep the great work. Good Luck with the blog. I can’t wait to read more. Thank you for following my blog. I also look forward to a succesful 2012 season. We have a strong core group of young players making there way up to San Diego. I’m excited. Life long Padres fan and with the exception of Tony Gwynn I follow and cheer for pitchers more than any other position (don’t tell my neighbor Merv Rettenmund). Thanks for being willing to blog for us fans; with all you’ve got on you plate, please know we appreciate the time and energy you put into this. Hope the Fall League experience is a good one for you. Thank you for the support! Pitching isn’t easy I’ll tell you that much so I appreciate it. Keep following my blog and of course keep the faith!